Here are my StoreFront customizations for Citrix StoreFront 2.6. Many are similar to previous version of SF, however some of the syntax changed. There are some good improvements/features SF 2.6 brings, one that I like and works best where I currently work is the Web Folder View, which in the past had to be done by running StoreFront in lock down mode. This new view can certainly help your users feel more comfortable when moving from Web Interface. Fist take a look at the new features of StoreFront which are listed under this link from Citrix. // what server data are we looking for? This is very helpful. That said, I’d love to see a similar write-up for customizing the Netscaler Gateway 10.5 login page. There is lots out there, but nothing that goes into such detail. Thanks for the post! I used your previous blog about StoreFront 2.5.2 customization, as template for our customization. But when trying to migrate to 2.6.0 in ran into a problem. The Continue button does not work anymore. I created a test store, and started with you Customization as starting point. omitting the " after the url as in your example doesn't show the a "continue button at all. What do I Miss? Please advise. Below is what I used. ‘<a href="#" class=…didnt work for me either so I hard coded the URL back to the home page. Send me an email @ danielruizorg@me.com and I will send you files if you need them. WordPress is messing up the code a bit. Yes now it’s working! Thanx! We use the 2.5.2 “folder view” script add on combined with mandatory mode. I got the suggestion that that’s included in 2.6.0 and that the ” folder-view” option does not require mandatory mode. Our company compliance team requires that we display a pre-login message that the system is a private computer system. We support both XenApp published desktops and seamless apps. 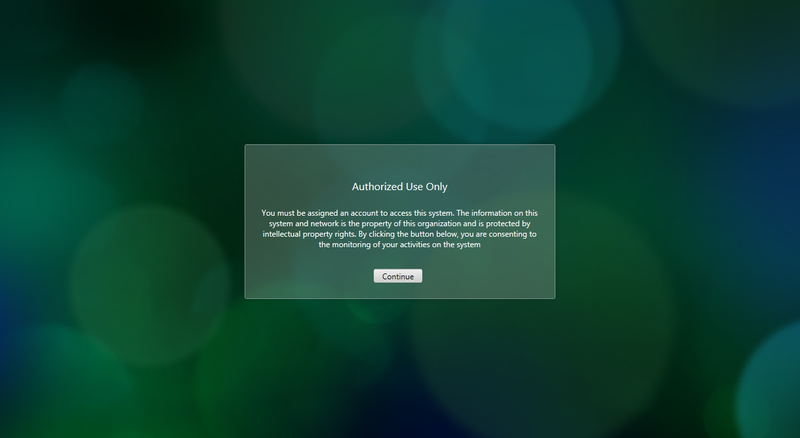 Is there any way to suppress the pre-login message for published apps, only when they are launched from within a published desktop (where the user has already accepted the pre-login disclaimer? To answer your question, I would create the published Desktop with the Citrix Receiver Enterprise running with the legacy PNagent config in StoreFront. This means users will launch the desktops and once logged in, the XenApp appliactions would show inside the desktop session. This way the users no longer need to launch the storefront web interface to launch any published xenapp apps you have. Does that make sense? To make it even easier for users you can tell StoreFront to not display any published Apps. Does this help you? I can send you more details if needed. Hi Danial, Can I ask one other thing . Is it possible to change the transparent middle part of the logon screen in storefront to a solid colour? Can you send me an email with a screenshot of what you need to change? Not exactly sure what you mean? Also curious about this. There is a large horizontal background behind the login portion of storefront. It looks almost like a white rectangle from left edge to right edge with an opacity of 10% or something. Can we bump the opacity so it is less transparent that normal? Can you send me a screenshot to danielruizorg@me.com. Not entirely sure I understand what you are referring to. I’m not getting the the message just the continue button on prelogin page. There are several files that need changes for Prelogin to work. 1. Update your custom.style.css under the contrib folder for your site. send me an email to danielruizorg@me.com and i will send you the code. WordPress is breaking the syntax. Had an issue with Pre-Login not working properly, the box would show, continue button worked, but no Text….. Using a tool such as Scite that is language/syntax aware makes it much easier. Again, BIG Thanks to Daniel for helping me w/ this offline and again keep up the good work w/ the awesome blogs!!! Is there some way to change the Continue Button to a button that redirects a user to a secure website where they can change their password if they have forgotten it, or have a URL on the Logon Page that redirects them to this page. Am I missing something here, I have tried about every example here but still do not get the pre log on message. Does it appear instantly after refreshing web page or do I have to wait a while or is there a service I need to restart? Getting pretty frustrated as nothing seams to change. Kev sending me an email to danielruizorg@me.com and I will send you the code. I need to change the font size and bold the User Name and Password labels on StoreFront 3.0 logon page. Could you please assist me with that? Could you please post the details to customize a post-logon message in SF 2.6? I tried using several articles but none of them worked. See my post at http://discussions.citrix.com/topic/382963-issues-with-post-loging-message-in-sf-26/ where I describe the code I used without results.